We’ve been hearing for decades now that print is dead. And the debate over whether or not this is true will probably continue for decades to come. However, as Joe Pulizzi once pointed out, there has never been a greater time of opportunity for brands in the printed channel than right now. So, as your business devotes more budget this year to content marketing (as 58 percent of B2B brands are doing in 2014), the question is, how can you get the most out of incorporating print into your content marketing plan? The key is to produce a highly niche, highly targeted publication that positions your business as a top expert on subject matter that your audience cares about. Why is the print approach making such a rebound? In this day and age of 140-character tweets, instant messages, and texts, print gives your customers something to sink their teeth into. You can discuss topics at greater length and give your readers something to hold onto for more than a few fleeting seconds. Since print is now considered “non-traditional,” it’s the perfect medium to use to capture — and hold — attention. After you’ve decided which audience you’re going to serve and which topic you’re going to tackle, it’s time to build your publication. Here are a few helpful tips that we’ve uncovered when producing The Flow, a magazine that serves the production print industry. In its first year, The Flow has gained a dedicated following among customers and other professionals in the field. As a key component in our content marketing plan, it has helped solidify our corporate identity as a leader in information management services and serves as a consistent resource for other businesses looking to evolve in the printing industry. Plan to deliver a variety of relevant content types: Resources for content creation can be drawn from within your own organization, which keeps costs down. Use your employees’ expertise and unique voices — after all, who knows your company better? Of course, you don’t want your magazine to appear to be just another promotional vehicle for your executives, so it’s also important to intermingle internal content with other content, such as features, Q&As, and even case studies from and by your customers — you will find they are the best sources for uncovering pain points that need to be addressed in your target industry. 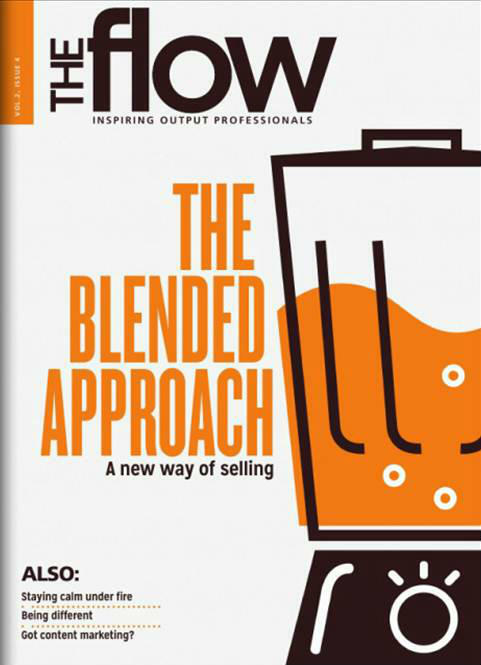 Mixing internal and externally sourced content in your print publication will give it the vendor-agnostic voice it needs and, most likely, you will find you already have enough content to get several articles started (think webinars, blogs, white papers, presentations, case studies, and customer press releases). Reuse the key concepts from these, but expand upon them for the magazine format. You can also curate data-specific content, like infographics from marketing sites. Our recipe has always been that you should do organic work first to gain the readers’ trust, and then build on that relationship. One of the biggest pitfalls companies can fall into is to create a publication that reads like a corporate brochure. Remember that the main idea behind your publication is to help identify challenges, successes, and trends that are happening in the market and that address your customers’ (or prospective customers’) questions, interests, wants, and needs. RCI’s Endless Vacation travel magazine — which took Best Magazine honors at last year’s Content Marketing Awards — is a great example. It balances content about exciting destinations and travel tips, with recommendations of RCI- (and non-RCI-) affiliated resorts. This tactic maintains RCI’s audiences’ trust by giving readers the choice of both, and by adding value to the content for its own resorts in the form of short excerpts from member reviews. As a printing company, our magazine is also a printing demonstration in and of itself — the medium is the message, so to speak. Using color design in an engaging way isn’t just good design, it’s also a good way of subtly showing, rather than telling, our customers what’s possible with our solutions. Pull quotes with insights from customers who the audience can relate to or influencers who they are familiar with, or text bubbles with stats are another hallmark. You can’t hold attention until you grab attention, and design elements are a great way of doing that. Use the right visuals: You need to select your images carefully, especially in today’s visually oriented society. The graphic elements you incorporate should do more than illustrate a point. They should create a compelling message for your audience through a visual medium. You want your visuals to make your readers shake their heads in knowing agreement or understanding your point, but wanting to ask questions. Visuals should add to, not just replace, words. “Imagery has to speak to what keeps your customers up at night”, says Potter. “We recently used a cover of a man with a confounding expression — with a caption asking, ‘Will you be relevant?‘” The image, while simple, was the type to elicit a double take. There was something a bit off-kilter about it. Large, bold images that have interplay with the magazine layout also make for great visuals. 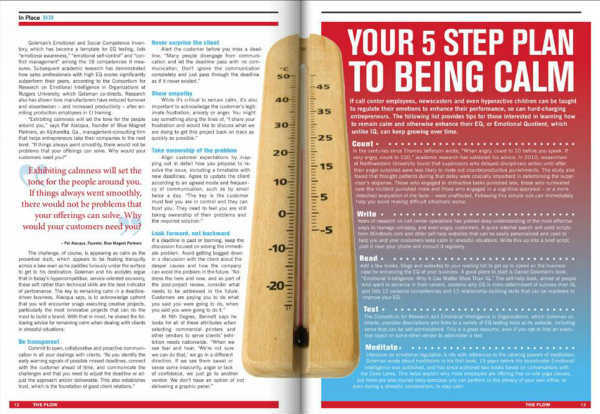 For example, for a story on a company that remained cool under fire, we used an image of a fire extinguisher that appeared to be “peeking out” from the edge of the page, and a page-long thermometer that spanned across the right and left side pages, with the thermometer’s reading running up the center spine. Fast Company and Esquire are two great examples of publications that use visuals in a savvy, stimulating way. They both use infographics to reveal useful nuggets of information to their communities in an unexpected way. Choosing the right imagery isn’t about great artwork but rather what connects well with the reader and story. Include social media: As with any content marketing tactic, you’ll want to tie your print content to the content you create for your other channels. For example, you’ll likely want an online companion to your print publication, such as a landing page on your company website, or even a dedicated website where you make your print content available for digital consumption. From there, incorporating social media can be as simple as using concepts or questions from the hard-copy articles and posting them to Facebook and Twitter to drive discussions. This also ties back to your visual choices. Images can be re-posted to Pinterest and Instagram to generate intrigue and drive more traffic to your publication. In The Flow, for example, our articles provide guidance and snippets of hot topics that the printing community needs to know. We encourage customers to reprint these snippets and additional Flow content for social media campaigns, their own blogs and websites, etc. 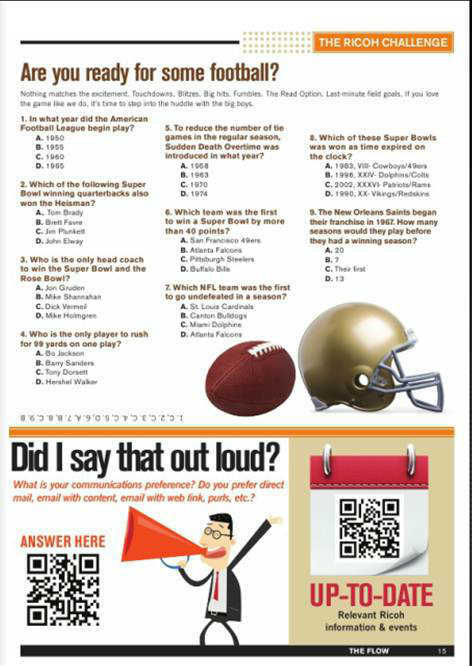 Using QR codes on an article is another tactic we’ve used to enable content sharing. We also use QR codes to solicit feedback about how readers want to get their information. Conversely, we always try to ensure that we’re multiplying the distribution of our magazine by re-sharing the content on our platforms. For example, we might put out organic content in printed form, then post it on social media as a blog, or put it out two months later in an email. “Content is king; distribution is queen,” says Potter. We believe this content can help smaller companies stay relevant and be included in larger conversations with other industry leaders as they attempt to have a bigger presence in the market. Size: There really is no optimal number of pages when it comes to producing this type of publication; however, remember that your readers are busy and attention spans can be short. As always, relevant content is key. Keep your magazine issues and articles long enough to tackle a few subjects important to your audience, but short enough to allow them to read it while commuting on the train into work. This will ensure the content is not just skimmed, but absorbed, evaluated, and shared. Can the reader digest it? People don’t have time to read a lot, so you want to give them the opportunity to educate themselves in an approachable format. Will they get a sense of accomplishment from reading it? For our magazine, an article that is about two full pages, with a sidebar, usually contains the right amount of content, along with a satisfying story arc. What is timely to the reader? For an issue that is running over on length, consider which articles can be postponed until the next issue. An industry magazine can be a win-win for all within a company’s ecosystem (marketers, sales people, product managers and, of course, customers). Have you considered starting an industry magazine, or are you already publishing one? What have been your challenges and successes? Tell us below. I would also like to thank Mark Potter, CEO at Conduit, Inc. and Publisher of Canvas Magazine, for his invaluable input on this post. Looking to take your content marketing to the next level? Download our e-book to get ideas from dozens of creative masters: Get Inspired: 75 (More) Content Marketing Examples. Annette McCrary is Director, Production Field Deployment at Ricoh, publisher of The Flow magazine. Contact her at Annette.McCrary@ricoh-usa.com.